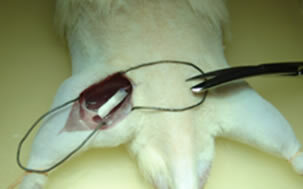 Studies on the regeneration of peripheral nerves in several animal models usually employ the entubulation technique (Figures 1 and 2) to connect the two stumps of a transected nerve. In the absence of a tube that acts as a bridge, the two stumps would degenerate into neuromas, i.e. 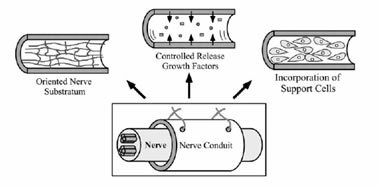 into the formation of a contractile capsule around each stump that would impede axonal regrowth. Cells responsible for the contraction process are known as myofibroblasts. The tubular scaffold has mainly the following functions: protecting the defect area from the collapse of surrounding tissues; retaining the growth factors that are naturally secreted in vivo after the injury; allowing and guiding axonal elongation from the proximal stump to the distal one. 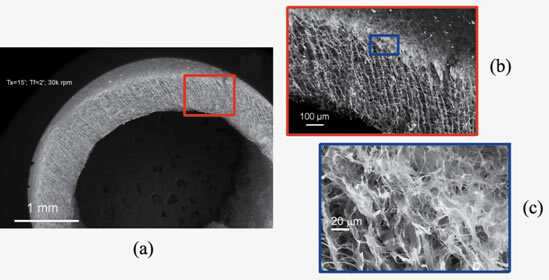 Our studies currently involve the development of collagen tubular scaffolds, with a radially oriented pore structure and a radial gradient of pore sizes (Figure 3), in order to study both the direction of myofibroblast migration, that takes place in the defect area, and its effect on the quality of regeneration. Several crosslinking techniques are employed to obtain tubular scaffolds with different stiffnesses and biodegradation rates in vivo. We also aim at producing cylindrical scaffolds with longitudinally oriented pores, to be inserted into the collagen tubes, that may accommodate elongating axons and/or exogenous cells and biomolecules. Various tube fillings can be adopted to enhance nerve regeneration (Figure 1). Figure 1. Entubulation of a transected peripheral nerve (bottom), with various tube fillings (top). Clockwise from top left: scaffold with axially oriented pore channels; soluble regulators of cell function, released either by the tube or by additional devices (e.g., microspheres) inserted into the tube; exogenous cells. Adapted from: Schmidt CE, Leach JB. Neural tissue engineering: strategies for repair and regeneration. Annu Rev Biomed Eng 2003;5:293-347. Figure 3. Cross-sectional SEM image (a) of the entire tube wall of a collagen tube fabricated using the spinning technique adopted in our lab; (b) the oriented porosity pattern can be appreciated; c) the outermost regions of the tube wall show a pore size <5 µm, as opposed to the pore size of about 20 µm found in the inner areas of the tube wall.